John Heffernan’s band, The Bullys, was booked to play at the Continental Club in Manhattan on Septmember 22nd. The club’s owner, who goes by the name Trigger, says, “He did it all out of love, and that’s what sets Johnny apart.” Fellow band member Joey Lanz adds, “It was amazing , the life he juggled, but when he was doing rock & roll, that was his passion.” The crowds at their shows had been growing, and The Bullys had hopes of hitting the road. Heffernan, 37, was also a New York firefighter, since 1993, but he had been doing music quite a bit longer: He first played at CBGB when he was seventeen, with a band called the Psychotics. 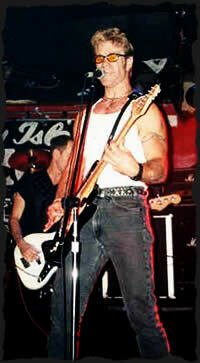 Bullys guitarist Walt Stack remembers meeting Heffernan in 1997. “Johnny came down to my job on his Harley,” Stack says. “He had on a leather vest and a scowl. He scared the hell out of me. He handed me this crusty old tape, and right away I dug it.” On another occasion, Heffernan pulled a tape from his vest and enticed Marky Ramone to produce the Bullys’ first album, Stomposition. Heffernan wrote and produced the band’s next recording, Tonight We Fight Again; the title track was an ode to his native Rockaway, Queens. In his personal life, though, Heffernan sang a gentler tune. At his wedding, he serenaded his wife, Lori, with Edwin McCain’s ballad “I’ll Be.” Marriage introduced a new element to Heffernan’s life: being a father to Lori’s nine-year-old daughter, Samantha. Heffernan taught her to swim, took her to her first rock concert, even filed and painted her fingernails. “He was a tough guy,” his brother Mike says, “But when Sammy came into his life, she marshmallowed him out.” When Heffernan died on September 11th, Lori lost her soul mate. “Now I’m not going to be seventy and wake up next to my love,” she says.